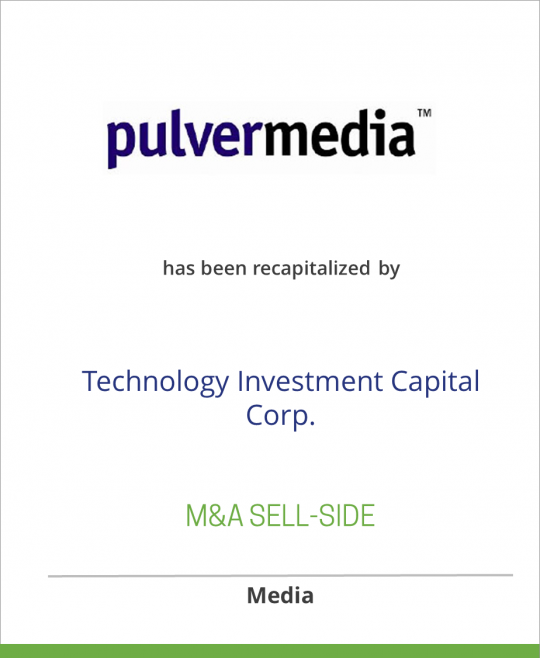 Pulvermedia Recapitalized by Technology Investment Capital Corp.
Pulvermedia has been recapitalized by Technology Investment Capital Corp.
Pulvermedia is the leading integrated media company that specializes in building communities and providing marketplace access through its unparalleled blend of trade shows, publications, web channels, and progressive cutting-edge media. As the foremost integrated media services company, pulvermedia is ideally poised to deliver a vast range of messages to a wide variety of different audiences, including technology buyers and sellers, government regulators, industry analysts, luminaries, pundits and bloggers. Technology Investment Capital Corp. (NASDAQ: TICC) is a business development company primarily engaged in providing capital to technology-related companies. TICC concentrates its investments in companies having annual revenues of less than $200 million and/or a market capitalization or enterprise value of less than $300 million, with a focus on businesses in the following sectors: Computer software and hardware Information technology infrastructure or services Internet Networking systems Diversified technology Medical device technology Telecommunications and telecommunications equipment Media Semiconductors Semiconductor capital equipment. TICC’s investment activities are managed by Technology Investment Management, LLC, an investment adviser that is registered under the Investment Advisers Act of 1940. Investment from Technology Investment Capital Corp.